This poster of Lake Champlain and the Northeastern Adirondack Mountains was taken from Vermont by photographer Gary Randorf. 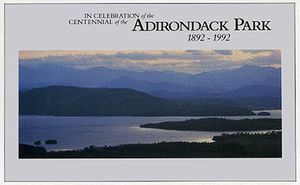 This poster was originally released to celebrate the Adirondack Park Centennial in 1992. Suitable for framing. 18"x24"